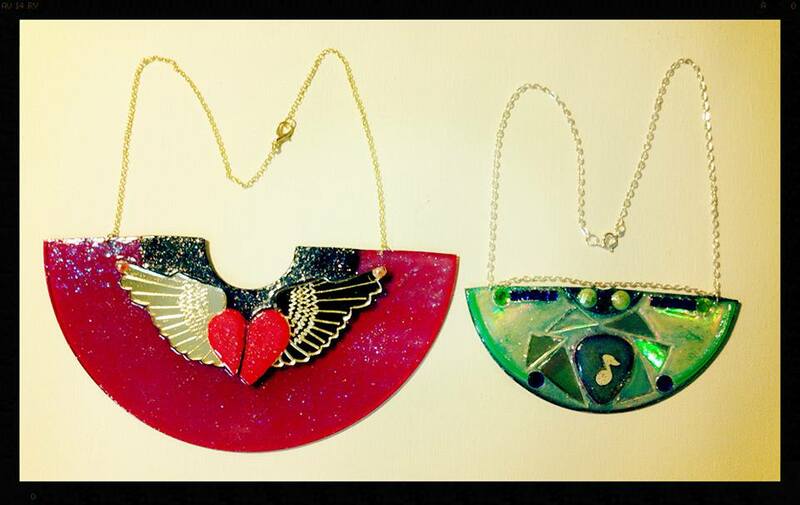 "Broken Heart 45" Record Necklace - A red 45 vinyl record cut in half with a refurbished broken heart pendant. Record is covered in glitter and Mod Podge Glitter. Necklace has a celestial feel with a Egyptian collar style. The best way to wear this is necklace is with a low top, v neck, scoop, and square tops. Recycled CD Necklace - Necklace features blue, green, purple and yellow gems, a guitar pick pendant and iridescent CD pieces. All of this was permanently glued on with several layers of Mod Podge. Edges are sanded and backside is painted with gorgeous glitter.